Do you also have that tendancy to always re-use the same things? From clothes and recipes to bakeware?! I have a wardrobe filled with lovely jumpers, flowery dresses, stripey T-Shirts and checked shirts – but I always end up wearing the same favorites… And, I have a bookshelf filled with cookery books and magazines, which I love reading over and over again – but I always end up making the same recipes… The same goes when it comes to my kitchen utensils! I’m a sucker for cute bakeware: from mini-cake tins and little cannelés pans to silicone and metal muffin tins, you name it, I have it! And so over the years my kitchen cupboards have filled with the most amazing baking tins – only for me not to use them! The other day I was rummaging through my baking cupboard, and came across these lovely little madeleine tins. I had bought them in Istanbul two years ago! Two years ago! Seriously, time flies by… So I decided that these poor little tins need to be released from their lonely existence, and finally get used! 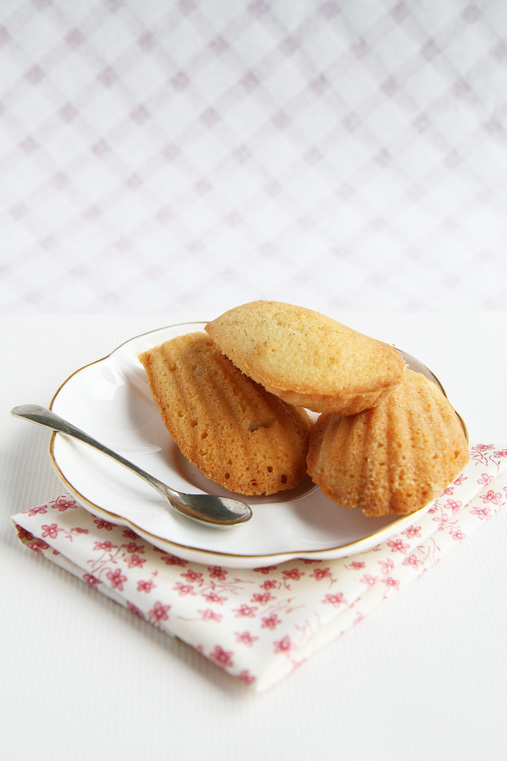 So, here you go: lovely little traditional madeleines – the kind that Proust would have been proud of! Now, a little note on food photography. First of all: I have been given the incredible opportunity to be a guest speaker at the “The Hive“, a European Blogging Conference that’s taking part in Berlin from 19th-20th May! But, don’t expect any long lecture from me, no no! Instead, I will be leading a food photography workshop! I’m currently brainstorming on how to do this, and on what to actually teach! Not so evident. In any case, food photography is by no means easy. It may look simple, but there’s a lot of thought going into each and every food photo. It’s just so easy to get it completely wrong – from the colour scheme to the background, crockery, fabrics, arrangement and food styling – Food photography can be a real minefield. So, I need to come up with a way of conveying the tricks that I’ve learnt over the past two years, and teach it to fellow bloggers… If you have any suggestions/questions about food photography, do let me know! I’m also currently playing around with Instagram and trying to get my head around how to use it for the sake of this site. Instagram photos have this fantastic quality that no matter what, they look delicious! It’s that nostalic filter that just works incredibly well with food photos! So, hopefully in the next weeks I’ll be adding an instagram widget to the sidebar of Anne’s Kitchen, so that I can post preview photos of upcoming posts. For now, you can follow my Instagram photos here, or just follow me on Twitter, where I’ll be regularly posting my yummy Instagram pics. 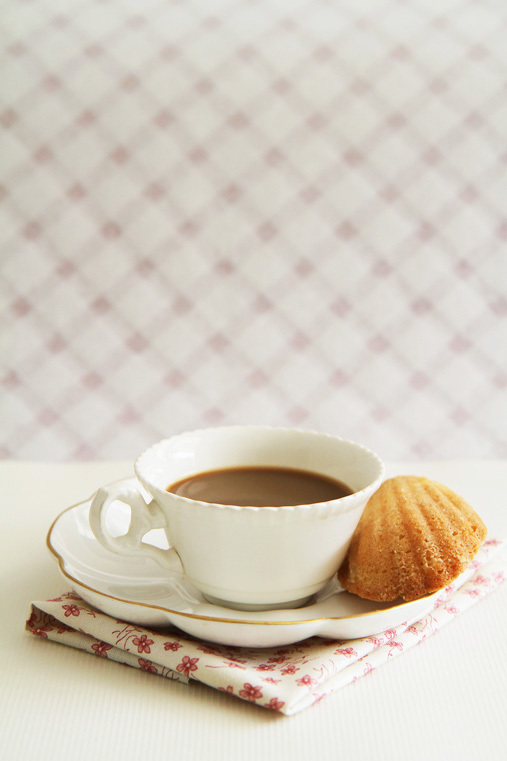 Melt the butter in a saucepan until it slightly starts to go slightly golden/brown – this will add a bit more flavour to the madeleines. Beat the egg whites until stiff, add the vanilla seeds or vanilla bean paste. 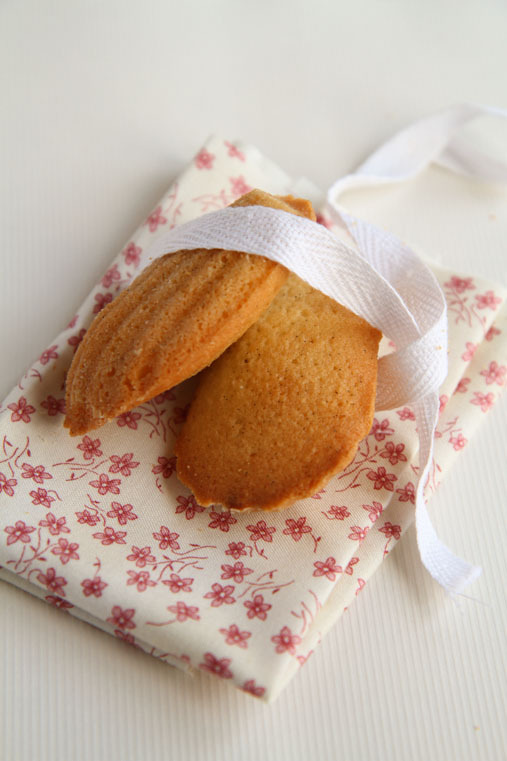 Mix the icing sugar, flour, baking powder and almonds. Incorporate into the fluffy egg whites. Cover the batter and leave in the fridge overnight (or at least for a few hours). The next day, preheat your oven to 180 degrees celsius. 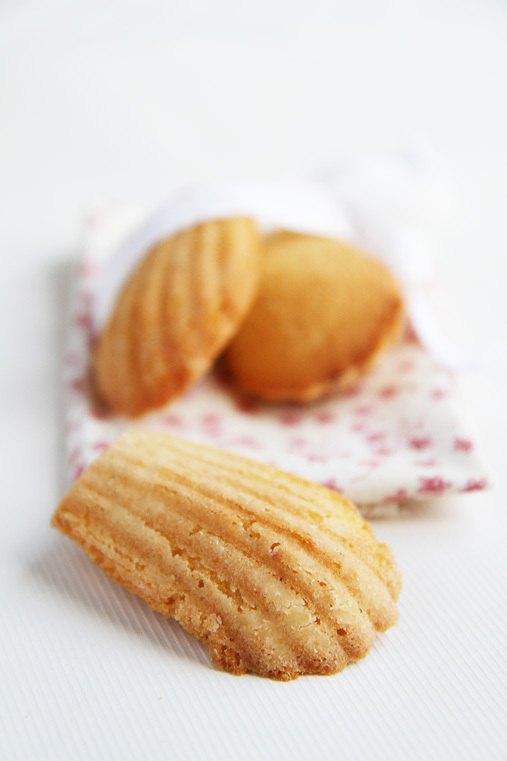 Grease your madelaine tins and lightly dust with flour, so that the madeleines come out easily in the end. 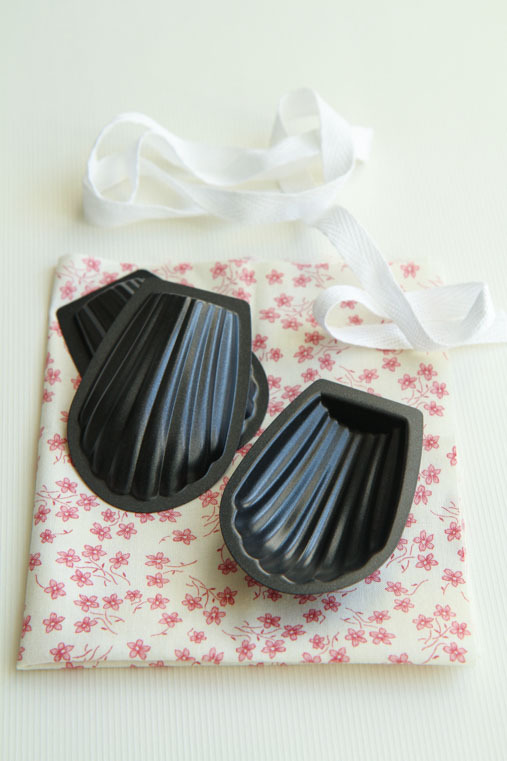 Fill the madeleine moulds with spoonfuls of batter. It’s a real art to fill them enough without overfilling. My trick is to fill them with batter, then use a knife and scrape over the mould once – like that you ‘cut off’ any excess batter. 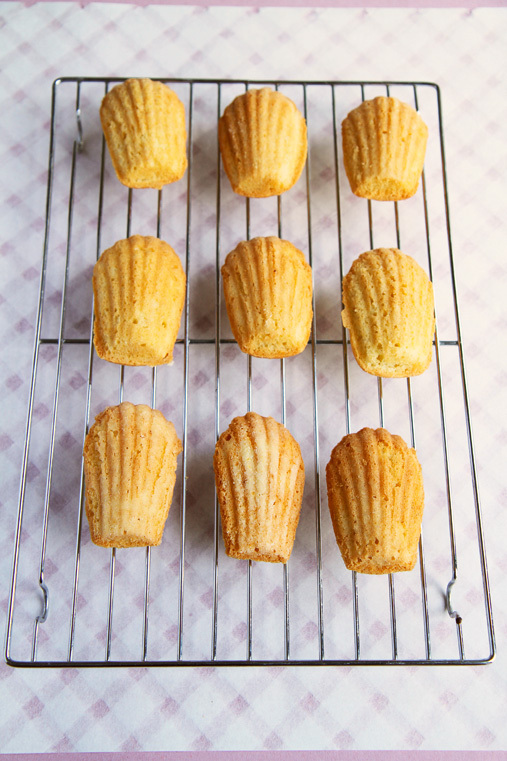 Bake for 15 to 20 minutes until the madeleines are nicely golden. Devour on the same day! These sound like delightful little treats. Love your photographs too!